What is the choice of fitting kits? New! 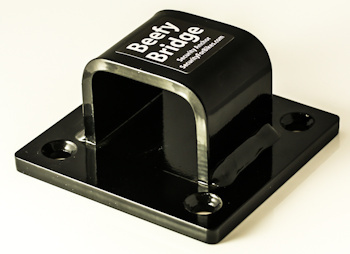 The Beefy Bridge is a high security ground anchor with far higher approvals than its price would suggest! It has Sold Secure Gold approval and is also Police approved (under the Secured-by-Design scheme). Unique in its price range, it is offered with a wide choice of fitting kits, to help you get a good result in a variety of situations. And as with all our anchors, it is made in Britain! This page gives more technical information about the Beefy Bridge ground anchor. It has two-stage corrosion protection with a zinc phosphate pretreatment and tough powder coating finish. It is Sold Secure Ground Anchors Gold approved. This means it has been tested and approved for use with motorcycles, bicycles, ATVs, etc. It is Police Preferred Specification - important to house builders, the Beefy Bridge ground anchor has genuine Police approval and is suitable for credit points under the Code for Sustainable Homes initiative. It is large enough to take high quality large-link security chains that cannot be bolt-cropped. Many ground anchors cannot cope with these chains. Smaller chains can be bolt-cropped in seconds using tools favoured by thieves. There is sufficient space for a single 19mm or 16mm or 13mm Protector (or similar) chain, or two Protector 11mm chains at once. Please note that it is not compatible with the Protector 22mm Titan chain! It is Made in Britain - Support British industry! In common with our market-leading Torc Ground Anchor, the Beefy Bridge has been designed for easy DIY fit in a wide range of situations using only DIY tools. Indeed, several of the fitting kits are exactly the same as those used with the Torc Ground Anchor. This anchor is lower cost, but you still get the benefit of top quality fixings! The instructions are written in a detailed, step-by-step way to guide you through the process of achieving a high-security fitting without needing exotic tools or advanced skills. There are numerous pictures and we are happy to give advice by e-mail. You should generally be able to fit the Beefy Bridge in less than an hour. The Beefy Bridge Ground Anchor is available with a choice of four fitting kits to suit your application. No other ground anchor at this price has the level of certification and the same choice of approved fitting kits! Each fitting kit is designed to give maximum security combined with ease of installation. In each package you will get a full fitting kit and fitting instructions, together with all the relevant bolts. 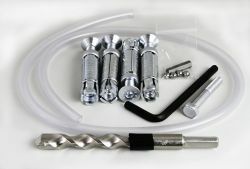 The concrete floor and injection resin kits include a 12mm masonry drill bit; the brick wall kit includes a 16mm masonry bit. Those kits also include a length of plastic pipe to help you clean dust from the holes! Note: Any ground anchor using expanding bolts should not be fitted to a wall within 2.0 metres (6 feet) of its top edge - do not fit it to a low garden wall! Similarly, you should choose a location that is at least 0.3 metres (1 foot) from the nearest end of the wall - don't fit it close to an external corner. This is because the expanding bolts exert a significant expansion force on the structure of the wall when the bolts are tightened up and this can cause bricks and mortar joints to split apart. The weight of the wall above the mounting point resists this expansion force. Remember: The wall needs to be strong! If the wall can be knocked over you have no security! Please note, also, that none of our fitting options are suitable to use on paving slabs or block paving. Please follow the link for more explanation and advice about fitting a ground anchor to paving slabs or block paving. Fixings: Quantity 4, grade 10.9 high tensile M10 socket countersunk bolts, zinc plated and all supplied with hammer-in ball bearings to defeat unscrewing and drilling attacks. Finish: Zinc phosphate followed by powder coating: Black. The Beefy Bridge has Sold Secure and Police approvals. Our approval certificates are available online.